Catch-up with the original caped crusader this Easter! 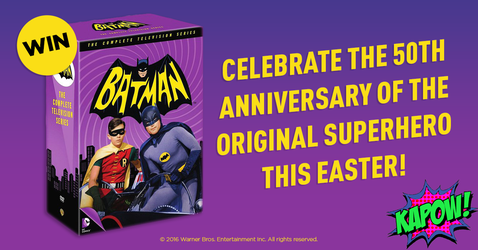 To help you celebrate in style, we have Batman: The Original TV Series on DVD up for grabs from Warner Bros. Home Entertainment. Celebrating it’s 50th Anniversary, this boxset features all 120 episodes from the 1960s live action series which follows the DC Comics superhero. Vigilante Batman (Adam West) and his sidekick Robin (Burt Ward) fight crime in Gotham City and attempt to bring down villains such as the Riddler (Frank Gorshin/John Astin), the Penguin (Burgess Meredith), the Joker (Cesar Romero) and Catwoman (Julie Newmar/Eartha Kitt). In the third series the dynamic duo are joined by Batgirl (Yvonne Craig), who helps them in their ongoing battle against crime. To be in with a chance of winning one Batman: The Original TV Series on DVD, just answer the question below.